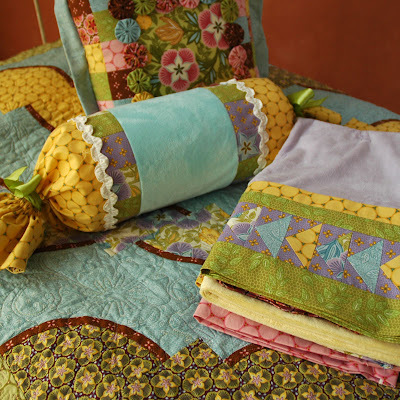 Amanda Murphy Design: Cuddle Up! I'm so excited to share "Cuddle Up", my latest free pattern, with you! I think I have mentioned that we are big fans of Cuddle fabric here. Huge fans. We all have robes made of Cuddle and blankets made of Cuddle, so the next logical step is, of course, pillows made of Cuddle! I wanted to trim these soft pillows with pieced cuffs. Cuddle comes in a wide range of colors and I easily found some that perfectly coordinated with my Ambrosia line. Oh - and I made sure that the edges of the cuddle fabric are completely encased in the seams in this pattern - so NO shedding after you sew. And then I had to sew a neckroll pillow, of course. I LOVE how neckroll pillows look, and couldn't resist adding some trim. Of course, I could hardly expect my ten year old to be enthusiastic about the flowery nature of these designs so I whipped up one for him in Robert Kaufman's Dr. Seuss fabric. 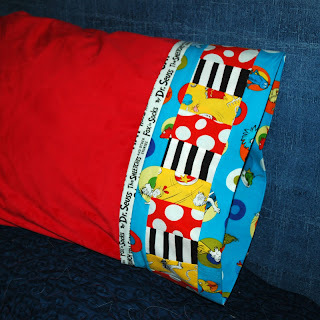 He has since said that, when his Dr. Seuss pillow is in the wash, he would consider using one of the other pillow cases so as not to go back to an ordinary pillow. Supreme compliment, don't you think? Mario at Shannon Fabrics gave me a great tip for times when you are working with lots of Cuddle: after you have cut your Cuddle fabric, but before piecing, throw it in the dryer. It really eats up those little pieces of fuzz. Thanks, Mario! One more thing... I just recently joined twitter. I'm a novice in the social networking arena but I am going to take the plunge. 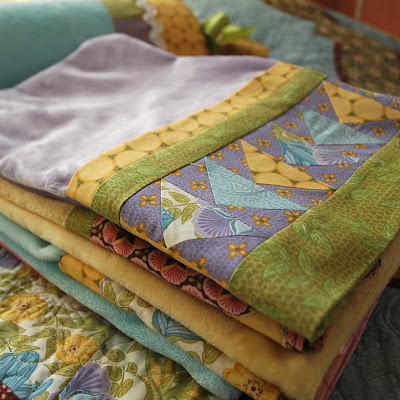 After all, only quilters and crafty people might be interested in following me and we are the nicest people in the world, if we do say so ourselves! As an aside, my computer-genius programming brother was no help in this area so I secretly want to be the expert in this one litle corner of the tech world - ha ha! If any of you have any interest in joining and watching me stumble along in the social networking world I'd be grateful. Just click on the twitter button on my sidebar and sign up! I hope you all enjoy the pattern! Love your pillows! Now I know what I'm going to sew today. Great fabric, I only wish I could find it here in Sweden. 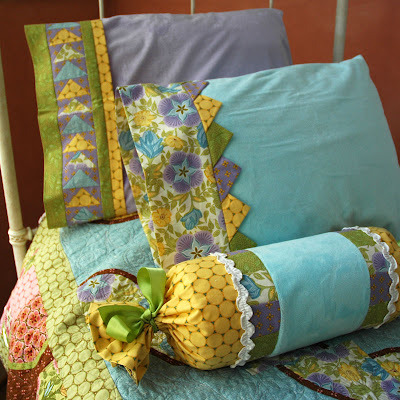 love the prairie points on the pillow! thanx for the free pattern; these are great. I adore the Ambrosia line and can't wait to sew a bed set for my bedroom. Ambrosia for spring and summer and Swiss Chocolate for fall and winter. I can't wait, thanks for the Cuddle Up pattern. Thank you so much for the patterns! I've never worked with Cuddle fabric before, but love the way it feels. I like the combination of regular cotton and the Cuddle fabric. I may just have to give this a try! Thanks! BTW love the pillows thank you for sharing. 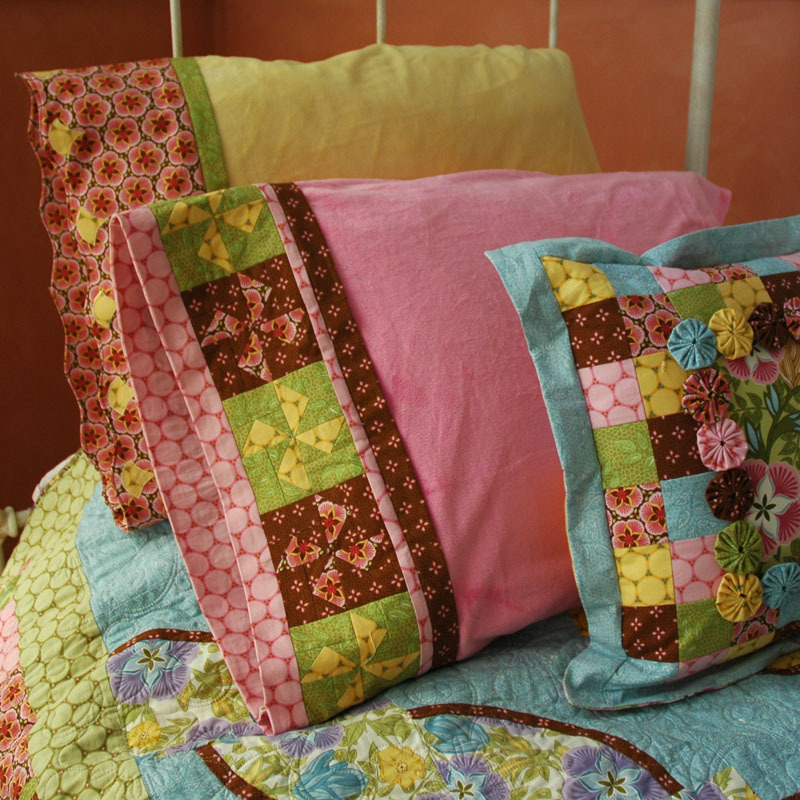 Love the colours in the 'cuddle' pillows. Thank you for the patterns. I'm on twitter but am a bit intermittent with tweeting. i have to draw the line somewhere or I would be on the computer more than the sewing machine! 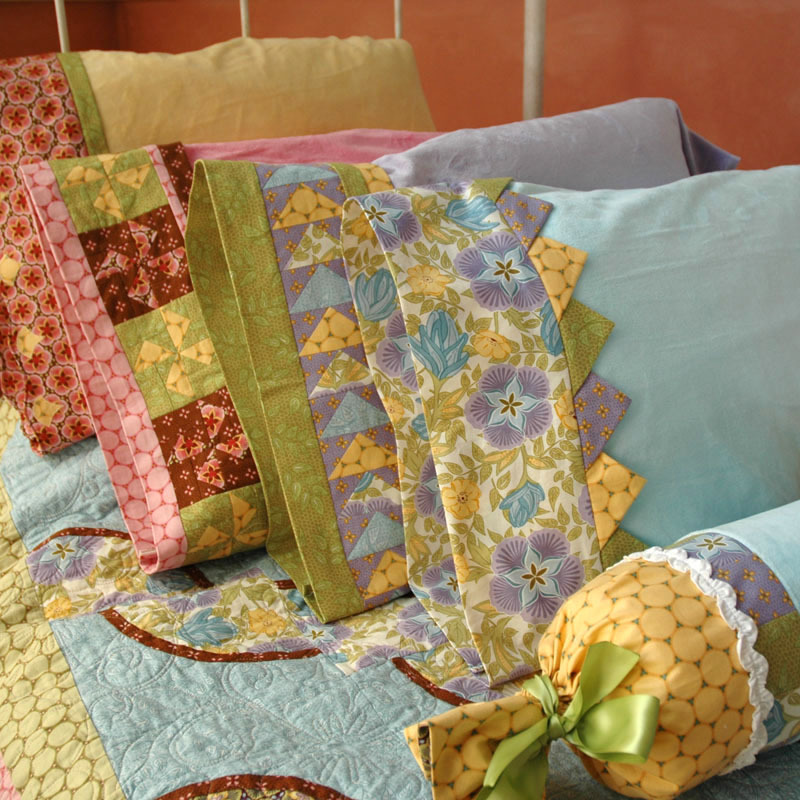 The pillows are beautiful, and that is the ultimate compliment if your 10 year old only wants that type of pillow now! I've not sewn with this type of fabric yet, so it's always good to get tips/ideas for it! Thanks very much for the pattern. Just love looking at the yummy pictures of the pillows all lined up. love the pattern and welcome to twitter! These pillow are beautiful! LOVE them. I think I will need to make some. Charming, thank-you for the pattern and inspiration.